What Can You Clean With Greenworks 2000? Greenworks is a leading manufacturer of residential pressure washers, with over 10 years of experience in keeping up with the needs of their customers. Their products are reliable, affordable and easy to use. We’ve prepared for you completely unbiased Greenworks 2000 psi review. This is one of their best selling products, so let’s see what it can do! Greenworks 2000 comes with a heavy-duty 13 Amp induction motor that transforms dirty and sticky surfaces to bright and clean areas within seconds. This pressure washer provides 2000 PSI and 1.2 GPM, which in terms of saving time means you won’t have to waste half of your afternoon washing the soap off your car. The total cleaning score of this unit is 2400. When you combine its power with a 25 feet high-pressure hose and 35 feet power cord, almost no surface is unreachable. If the areas you’re planning to cover with this tool are a bit larger, that’s quite alright as well. The total weight of this pressure washer is just 37 pounds. It has two compact wheels which make it stable and easy to move around. This practical unit can be used both vertically and horizontally. When you order this unit, everything you might need for a successful cleaning is delivered along with it. 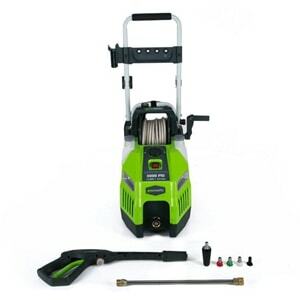 All Greenworks pressure washers come with their own high-pressure hose that is quite durable. This model also has a hose reel and a cable holder for easy storage and transportation. We’ve tested the Greenworks 2000 on cars, patios and even facades. Overall results were quite satisfactory. Greenworks pressure washers come with a one year warranty. If the product is bought for commercial use then the warranty is shorter and lasts only 90 days. We would advise you to invest in a commercial-grade unit that comes with several years of warranty and is intended for prolonged use because residential cleaners like this one don’t fare well with commercial use. Greenworks warranty also applies to damages that occur during shipping, so when you order their products, you can rest easy knowing that if the unit you receive is defective or damaged, you will be fully covered. Always inspect the received packages as soon as they are delivered. If Greenworks accepts a return under Warranty, you can return the defective or damaged product after contacting and receiving a Return Authorization from Greenworks. In this case, you will receive a refund for your original shipping charges, and Greenworks will arrange and pay for the return shipping charges. With this pressure washer, you can easily wash the dirt, grime, and mildew off of most surfaces. It’s perfect for washing your car after an off-road adventure. For tasks such as cleaning your patio or stairs, this tool is a real time saver. This model comes with 3 nozzles – 25 degrees, 40 degrees, and a Turbo Nozzle. These nozzle tips let you adjust the spray for the task at hand. The spray gun with a trigger makes washing the dirt off of your decks almost a fun task. All in all, this household tool can be used for most cleaning jobs around your home. You cannot strip paint, and cleaning the driveway will take you a bit more time, but it can be done. If you want to give your home a makeover, try showering the facade or washing the sidings to prepare them for a painting job. Window washing is also very quick and simple, just make sure to use the right nozzle. Greenworks 2000 is a simple to operate pressure washer with compact design and wheels that make it easy to move around. Greenworks has good warranty policies so you can rest assured you will be covered. The high-pressure hose reel and cable holder make this unit very easy to pack and store away. This product is not a heavy-duty tool, so you may experience some troubles if you are trying to get rid of the nasty stains. Also, the grip might cause you to discomfort over prolonged periods of time if you don’t take a break. You might be dissatisfied with the results after trying to clean some heavy grease off your grill. This model, just like every other pressure washer on the market, has its fans and haters. What is most important is that you know what you’ll be using it for. If you’re looking for a budget-friendly, mid-duty tool that you can easily move around and store, then this is it. You cannot make a mistake if you know the unit’s limitations, and we have presented them in our review. It is so simple to use that this one of the well-known pressure washers of Greenworks can even be used by children and help turn tasks such as washing your car or dirty windows into a fun family game. If this sounds anything like the thing you’re looking for, then Greenworks 2000 PSI pressure washer won’t disappoint. For the low price, you can get your own pressure washer, which is a smarter decision than renting the units. If used with care and by following the guidelines in the user manual, this power washer can last long enough to be considered a smart investment. We hope we have covered all the important questions in these Greenworks 2000 psi review. However, if there are any topics left unanswered, feel free to write them in the comments section below, and we will respond promptly.